OVERLAND PARK, Kan. — A group of artists is spearheading a project years in the making that would brighten the walls of downtown Overland Park, Kansas, building with a series of murals. “[It] transforms blank spaces into a more interactive space. It also activates the community and the voices of the community on all sides,” said Nicole Emanuel, founder of InterUrban ArtHouse. These murals, done by six local artists, would be colorful additions to privately-owned buildings throughout downtown. That area of town is anchored with small businesses of all sorts and a growing art scene. There’s also a boom in development. Multiple apartments are either under construction or have recently been built. “We have a dominant visual of all the new construction projects coming in, and there's lots of faces in the community and it's important that we show that in various ways, and this is one way,” Emanuel said. The InterUrban ArtHouse is a local art space where artists can rent out studios. The space features local art in exhibitions and presentations. They plan to do the project with a $15,000 grant from the Kansas Department of Commerce, plus an additional grant from a private donor. 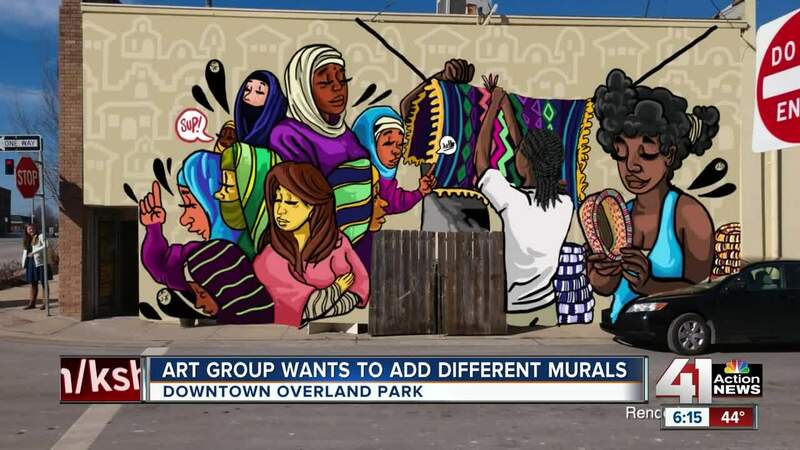 One mural will go on the back of Ten Thousand Villages, a non-profit fair trade store at 80th & Santa Fe. Business owners say they're excited to see this happen. “We feel that the mural that will be on the back of this building will be a wonderful representation of the artisans we work with all over the world, but also it'll complement our community as well,” said Kendra Frink, executive director of Ten Thousand Villages. The project also includes a sculpture and several mosaic benches, which will be funded by the city. The murals show women of all backgrounds in vibrant colors, plus the state bird (a western meadowlark) and a bluegill, one of the most common fish in the state. “Who lived here before it was settled — it's who is growing food in the farmers market, who is living and working in this area,” Emanuel said. The project needs approval from the Overland Park city council on May 20. There will be public input and a vote. “Just that wonderful piece of color, what it does to get people excited and intrigued into the neighborhood and what this neighborhood is all about,” Frink said. InterUrban ArtHouse is holding a series of community meetings until then. The next meeting is April 16 at the Arts and Rec Foundation of OP at 5:30 p.m.